Today we discuss the recent “foiled terror plot” from a new “underwear bomber” that has recently been exposed as a CIA covert exercise. The mainstream media has been using the incident to instill fear into the minds of the masses in order to justify the continued war on terror. We also look at a leaked military document that seeks to set up reeducation camps for political dissidents. b-in a situation of civil unrest, most likely under martial law, where anyone who resists its imposition could be detained as a Civilian Internee. It is apparent to me that the documents are not describing the rounding up of activists in a non-emergency/martial law situation, for the purpose of suppressing free speech or political dissent. Rather, they describe the capture of anyone ‘going againts US interests’ in a situation of civil unrest. However, the documents also refer specifically to PSYOP officers quelling political activism inside these facilities and using ‘psyop products’ to keep inmates in line and crush any rebellion against their captors. 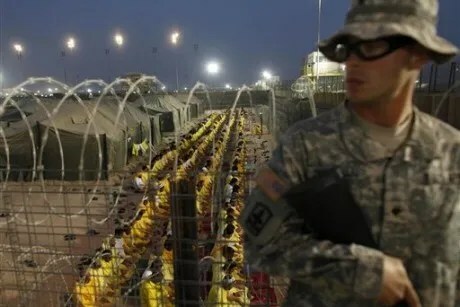 A leaked U.S. Army document prepared for the Department of Defense contains shocking plans for “political activists” to be pacified by “PSYOP officers” into developing an “appreciation of U.S. policies” while detained in prison camps inside the United States. The document, entitled FM 3-39.40 Internment and Resettlement Operations (PDF) was originally released on a restricted basis to the DoD in February 2010, but has now been leaked online. The manual outlines policies for processing detainees into internment camps both globally and inside the United States. International agencies like the UN and the Red Cross are named as partners in addition to domestic federal agencies including the Department of Homeland Security and FEMA. Once the detainees have been processed into the internment camp, the manual explains how they will be “indoctrinated,” with a particular focus on targeting political dissidents, into expressing support for U.S. policies. The re-education process is the responsibility of the “Psychological Operations Officer,” whose job it is to design “PSYOP products that are designed to pacify and acclimate detainees or DCs to accept U.S. I/R facility authority and regulations,” according to the document. The manual lists the following roles that are designated to the “PSYOP team”. – Identifies malcontents, trained agitators, and political leaders within the facility who may try to organize resistance or create disturbances. – Develops and executes indoctrination programs to reduce or remove antagonistic attitudes. – Provides loudspeaker support (such as administrative announcements and facility instructions when necessary). – Helps the military police commander control detainee and DC populations during emergencies. – Plans and executes a PSYOP program that produces an understanding and appreciation of U.S. policies and actions. The historical significance of states using internment camps to re-educate detainees centers around the fact that it is almost exclusively practiced by repressive and dictatorial regimes like the former Soviet Union and Stalinist regimes like modern day North Korea. We have exhaustively documented preparations for the mass internment of citizens inside America, but this is the first time that language concerning the re-education of detainees, in particular political activists, has cropped up in our research. In 2009, the National Guard posted a number of job opportunities looking for “Internment/Resettlement Specialists” to work in “civilian internee camps” within the United States. In December last year it was also revealed that Halliburton subsidiary KBR is seeking sub-contractors to staff and outfit “emergency environment” camps located in five regions of the United States. In 2006, KBR was contracted by Homeland Security to build detention centers designed to deal with “an emergency influx of immigrants into the U.S,” or the rapid development of unspecified “new programs” that would require large numbers of people to be interned. Rex 84, short for Readiness Exercise 1984, was established under the pretext of a “mass exodus” of illegal aliens crossing the Mexican/US border, the same pretense used in the language of the KBR request for services. Under the indefinite detention provision of the National Defense Authorization Act, which was signed by Barack Obama on New Year’s Eve, American citizens can be kidnapped and detained indefinitely without trial. Read a portion of the Internment and Resettlement Operations manual below. The following portions of the document make it clear that the policies apply “within U.S. territory” (as well as abroad in countries like Iraq and Afghanistan) and that domestic federal agencies are involved. Paul Joseph Watson is the editor and writer for Prison Planet.com. He is the author of Order Out Of Chaos. Watson is also a regular fill-in host for The Alex Jones Show and Infowars Nightly News. Document – http://publicintelligence.net/restricted-u-s-army-internment-and-resettlement… Mirror – https://www.documentcloud.org/documents/352179-usarmy-internmentresettlement…. End the Lie Radio with Madison Ruppert and guest, Activist Post writer Brandon Turbeville, discussing the full-spectrum eradication of the freedoms guaranteed under the U.S. Constitution. Brandon Turbeville is an author out of Mullins, South Carolina. He has a Bachelor’s Degree from Francis Marion University and is the author of three books, Codex Alimentarius — The End of Health Freedom, 7 Real Conspiracies, and Five Sense Solutions. Turbeville has published over one hundred articles dealing with a wide variety of subjects including health, economics, government corruption, and civil liberties. All material(s) used in this video that are not original or are under copyright are used under Fair Use under the Copyright Act of 1976, 17 U.S.C. § 107. For some people, the Federal Emergency Management Agency is just that – an agency that manages emergencies, or at least tries to, and often screws it up. To others, FEMA is an apt example of the disturbing blurring of the lines between local, state and federal law enforcement and even perhaps a danger to the American people with the moves to create operable detention centers on 72 hours’ notice through KBR. Not to mention that FEMA is part of what I have no problem calling one of the most problematic government agencies, the Department of Homeland Security (DHS). Apparently FEMA is trying to help twist the public’s perception of them and their work, not by actually improving themselves but instead by monitoring media coverage in order to present a better face. This monitoring, archiving and analysis would spread across all local news in all “major Nielsen markets,” along with all nationally broadcasted news and all cable news outlets for their coverage of FEMA and their activities. The monitoring service will be tasked with giving FEMA “media statistics including the audience exposure and publicity value,” for any given news coverage. “Publicity value” is not defined but one can assume that this is either a subjective determination of the impact of a news story or perhaps an objective determination based on how many outlets cover a given story/event, what the tone of the coverage is (positive or negative), how much time is given to the coverage, etc. Currently, the FEMA office of external affairs monitors news coverage for their Joint Field Offices (JFOs) along with their headquarters’ broadcast operations. The project seems to be considerably large, with the solicitation stating that it should be able to hold an unlimited number of digital clips, permanent archiving of said clips, unlimited keyword searches and editing capabilities. Given this capability, it is not a leap to wonder if it might be used to monitor and archive online video and independent news as well. “The contractor shall provide at least 11 accessible accounts or individual passwords to access the service (with a potential surge capacity of 40 if needed during extremely high disaster activity),” reads the statement of work. The time frame on this proposal is surprisingly small, with only two days (until February 17) for prospective small businesses to submit questions about the project and until February 23 to have their complete proposals completed and submitted. This program is clearly not something with the short-term in mind, as FEMA is looking to make this single contract into an indefinite delivery/indefinite quantity, or IDIQ, contract. This contract would have a one-year base period and three one-year options although it could be extended indefinitely beyond that. Seeing as we have no money to spend to begin with, making these kinds of plans seems nothing short of foolish. No price range is given, instead it is written that, “Price will be evaluated using price analysis to determine the extent to which it is reasonable, realistic, and consistent with the proposal.” Meaning we have absolutely no idea how much we will be paying for FEMA to monitor the news. It seems quite clear to me that the real reason that FEMA is pursuing this project is to increase their ability to craft public statements and their approach to dealing with the public in an attempt to get the public to see the agency more favorably. This could also be used to help them engineer better ways to announce disasters, direct the public and generally how to more aptly present themselves as to create the reaction they seek, be it positive or negative. I don’t see any legitimate reason why this should be paid for when there are countless Americans living in the streets or out of cars, struggling to survive and even more who are struggling to get an education or a job. Yet, if historical precedent is any indicator, I expect to see this contract fulfilled without a hitch and without comment from the mainstream media, as per usual. CHICAGO — An uncanny site as human bodies in makeshift pine boxes are unloaded from a private U-Hual truck. Mass graves prepared for U.S. citizens are not an urban legend, but a reality originally exposed by Shepard Ambellas of The Intel Hub in March of 2009 on The Alex Jones Show (and infowars.com) with the article titled: Military Industrial Complex Prepares Mass Graves for U.S. Citizens. Now as a total breakdown of society and an economic collapse looms, the makeshift graves are stacking up. No mourners were present for the burial at the cemetery, which lies 25 miles south west of Chicago. The gruesome discovery of the pauper’s burial section at Homewood was made last year, sparking a call for more strict federal regulations for cemeteries. Sheriff’s officials had found caskets stacked on top of one another – some buried eight at a time – at Homewood. And the morgue has been accused of missing markers and poor record keeping. But coroners have said the practice is shared in other cities and states across the U.S.
Tony Cox, the legislative chairman and former president of the Illinois Coroners and Medical Examiners Association, earlier told the Chicago Sun Timesother cities, including New York, follow similar mass burial procedures for those with limited options. New York City Department of Corrections spokesman Stephen Morello referred to a burial site in Hart Island, New York, where 800,000 bodies lie. Officials there, he said, follow the same procedure – stacking coffins with inmates’ remains three deep. Although the size of this operation pales in comparison to the original mass graves Ambellas exposed in 2009, it is still a gruesome find. One can only wonder if the homeless will be rounded up into FEMA camps and then disposed of in mass graves already set in place nationwide. Below is a letter composed by one of our peace officers in Ohio. This letter was written to raise awareness of the ominous problems in the National Defense Authorization Act of 2012. Because Jim Singleton is a State chapter officer for Ohio Oath Keepers and is Ohio’s Peace Officer Liaison, this letter will be circulated within LE communities around Ohio. I am placing this letter on our national website as a guide and/or template for all Peace Officer members in Oath Keepers in all State chapters. All are encouraged to write their own letters and mail to all Peace Officer offices in respective States. Oath Keepers is mobilizing on various fronts in response to the travesty called NDAA-2012. Oath Keepers salutes current-serving Peace Officer Jim Singleton, our Ohio chapter Secretary. It’s unfortunate that I have to write this letter, however in light of current events it is inevitable. Just days ago the United States Congress passed the NDAA (National Defense Authorization Act) this in itself was necessary. However in this bill was an insidious piece of verbiage that for all intents and purposes destroys the foundation of everything we believe in and took an oath to uphold. To me the possibility of those citizens and others under my protection being spirited off in the middle of the night by agents of the military, then being summarily incarcerated without access to judge or jury are insufferable and intolerable acts. It will be argued that this only applies to foreign persons or others suspected of terrorism, but there are far too many avenues available to apply this to any group to which any administration may take umbrage with. When growing up and especially during our training in the academy we are instructed that the constitutional rights of all must be upheld at all times, as well as the respect for all people we come in contact with or represent. This section of the NDAA attempts to remove those rights which are enumerated and given to us by our creator, and places them in the hands of the office of the President of the United States to be disregarded at his whim. And in those few words lies a conundrum, do we as police officers, sheriffs, deputies and others who have taken the oath to uphold and defend the constitution, now turn our back on that very oath? Do we now turn against the very same people that entrusted us with a most sacred duty to serve and protect them? If in fact we follow a rule of law such as this bill enacts, it would mean that the oath that we all took meant nothing. We are obliged to follow all lawful orders given to us, but we cannot do this blindly. History has seen the result of these acts and has judged them accordingly. I can only ask all of you to take a moment to reflect upon all that we are taught and hold dear, the people we serve deserve and demand our highest respect for it is through them and they alone that we were given this oath. Do we simply turn a blind eye for the sake of political expediency and lose our respect? Is a few pieces of silver so dear that we would sell our honor for it? How will we explain to our friends and loved ones why members of our community were spirited away or how will they see us when they realize (that when their time comes) we won’t be there for them? I believe that if and when those orders come, I cannot in good faith and in strict observance to my oath, allow myself to be a part of them. I would hope that members of our military in accordance to the articles of the UCMJ, would also refuse them as well. When that time comes I will do exactly as I have sworn to do, I will serve and protect those under my care, so help me God. Whom shall I send, and who will go for us? On the Friday edition of the Alex Jones Show, Alex talks with a Department of Defense Space and Naval Warfare Systems Command source who provides more detail on the military, Department of Homeland Security and FEMA push to build detainment camps and outfit them with contractors, a story covered by Infowars.com earlier in the week. VIDEO -- Child Victim was Raped 1800 Times By Satanic Cult who Followed The Teachings of Aleister Crowley!